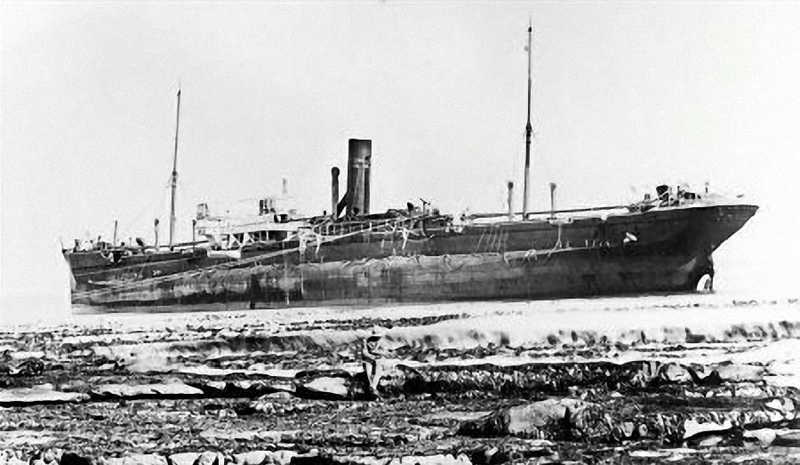 The "SS Clan Monroe ” was wrecked in a north westerly storm that hit the coastline in the winter of July 1905. The wreck settled on a large rock shelf where for years she was visible as a large black box to the locals. She was used to guage the height of the tide by people living in Kommetjie. Over the years the sea and waves took their toll on the ship and she eventually broke up and sank beneath the waves. 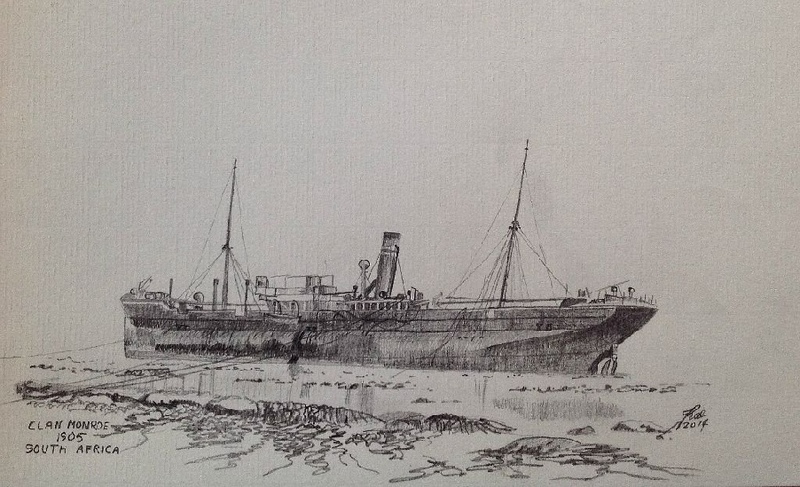 It was one of eight of the Clan Line to be wrecked on the South African coast. REPORT of a Court of Inquiry held at Cape Town to investigate the circumstances attending the stranding of the steamship "CLAN MONROE," off Slangkop Point, on the 1st July, 1905, and the working of the life-saving apparatus on that occasion. The "Clan Monroe" was a steamer of 3121 tons registered tonnage, official number 106097, belonging to the port of Glasgow. It appears from the evidence given before this Court that she sailed from Liverpool on the 7th June, 1905, bound for Natal, Delagoa Bay, and Mauritius with a general cargo, and a crew of 82 hands all told. 1. That the steamer's position having been ascertained at noon by the master, Thomas Brown, and officers, and verified by distance passed off Dassen Island, viz., 19 miles, the course steered from there would have been a safe one under ordinary circumstances had the lights been visible. That the cause of the stranding was due to a strong inset (as mentioned on page 322, African Pilot, part 2) not allowed for by the master. That the master committed a grave error of judgment in not guarding against this, insomuch that, having run the distance to where Robben Island or Cape of Good Hope light should have been visible he continued his course without sounding, or otherwise hauling out from the land. That up to Dassen Island the vessel appears to have been navigated with due care and caution. That the vessel was well found and sufficiently manned and seaworthy in every respect and properly supplied with charts, sailing directions and other navigational appliances, and that the compasses were in good order, and that after the vessel stranded, the master, Thomas Brown, appears to have done everything in his power to avert loss of life (the crew having been saved by rocket apparatus). That, in view of the above, we do not consider it necessary to deal with the certificates which are therefore returned to their owners. That the Court specially desires to direct attention to the fact that a light is urgently required at Slangkop Point, the Cape Point light being so high as to be frequently obscured, as in this case, by fog or mist. Report on the Life-Saving Apparatus. The Court finds that the rocket apparatus was in good order and well looked after. That the delay in landing the crew appears to have been due to the parting of the endless whip, which, in its opinion, was caused, in the first place, through its becoming twisted by being hauled out by the ship's rope instead of by the rocket line, and, secondly, through its fouling the bottom and becoming entangled in the sea-weed and rocks. That no blame is attributable to anyone, every-one concerned having used his utmost endeavours to render assistance in the rescuing of the crew. There appears to have been an unnecessarily long delay in getting the special train away from Cape Town after the arrival of the apparatus at the station. We strongly recommend that, either the apparatus at present kept at the Castle be transferred to Simonstown, or that an additional apparatus be established at Simonstown.